The carefully selected veneers are joined together. Bl�thner uses only veneers that come from the same log to avoid differences in colour and pattern. For every little curve on a part of the case that has to be veneered special moulds are necessary. They are pressed together with clamps. 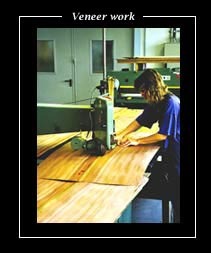 Special skill is needed to select and join the veneer to the required pattern. Instruments made in these different designs are pieces of art. Here the veneer for a Bl�thner Ambassador from the supreme collection is laid.